Day by day, insurance fraud in India is rising. The most common way of cheating is by fraudsters, pretending to be IRDA representatives. Fraudsters pose as representatives of the Insurance Regulatory and Development Authority (IRDA). They call existing life insurance policyholders and tell them, they are entitled to receive a bonus from IRDA, for a life insurance policy they have availed. However, to receive the bonus, the policy holder has to purchase a new life insurance policy and after a few months, he will receive the bonus. In this blog we will discuss some of the tricks to stay alert and protect yourself from insurance frauds. IRDAI does not announce any bonuses and is not involved in activities like sale of any kind of insurance plans or financial products. If you receive such calls, lodge a police complaint immediately, along with details of the phone call. Never trust your insurance agent blindly. You should check his/her background and the unique code allotted by the IRDAI. 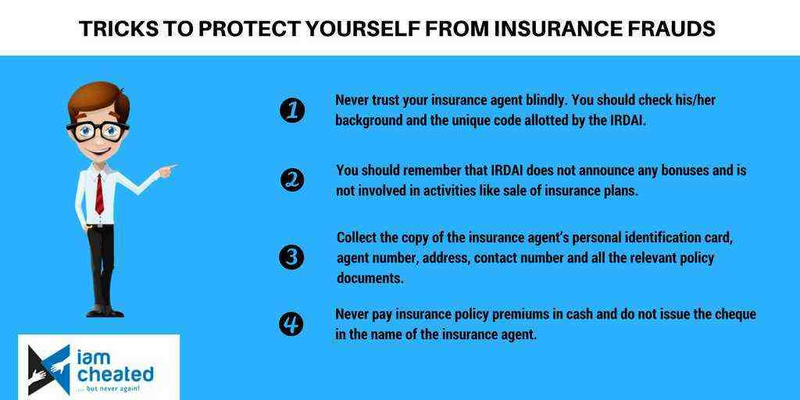 IRDAI allots a unique code to every authorized insurance agent or broker. You should also check the social media profiles of the insurers they represent. You should always remember that IRDAI is not a mediator between you and the insurer. It never recommends that you switch between life insurance plans. Collect the copy of the insurance agent’s personal identification card, agent number, address, contact number and all the relevant policy documents. Never pay insurance policy premiums in cash. Make the premium payments through cheque, demand draft or online payments. Do not issue the cheque in the name of the insurance agent. Instead, directly issue it in the name of the insurer.